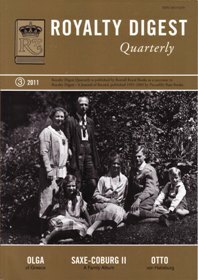 Royalty Digest Quarterly no. 3, 2011 arrived in my mailbox last week. As usual I will give a short presentation of its contents. In his Editor's Corner Ted Rosvall has not very surprisingly decided to comment on the pregnancy of HRH Crown Princess Victoria Sweden. Rosvall's main focus this time is his disagreement with the claim that Victoria marks the end of the Bernadotte dynasty on the Swedish throne, as the future child, which is expected in March 2012, will be a Westling. Rosvall hammers away: "Rubbish, I say! Uneducated, stubborn, macho rubbish!" Of course I agree with Rosvall. I am not going to ignore the fact that traditionally - and genealogically speaking - dynastic and family names are inherited through the agnatic line. But the times have changed, and the name laws in Scandinavia, to take one example, open up for many possibilities concerning the choice of a child's surname. And of course there are many dynastic names which have carried on through the cognatic line, such as Oranje-Nassau, Romanov and Grimaldi. Finally, the fact remains that Prince Daniel has formally taken the surname Bernadotte (see my articles (1) and (2) of June 2010), so the future heir will definately be a Bernadotte, regardless of what the traditionalists say! Following the Editor's Corner, Robert Prentice has the honour of being credited the first article of this issue, titled Princess Olga of Greece and Yugoslavia. Princess Olga was the daughter of Prince Nicholas of Greece and his wife Princess Helena, née Grand Princess of Russia. Prentice's sources include conversations and correspondence with numerous family members. No issue of Royalty Digest Quarterly without the traditional family album provided by the periodical's historical consultant, Charlotte Zeepvat. This time we get the 2nd part of her Saxe-Coburg series. In RDQ no. 2, 2011 we were introduced to the Saalfeld and Kohary branch. This time the focus is on Saxe-Coburg and Gotha, and we get a short introduction besides the main part - a 21 pages' long family album, or 23 pages if we include the photos above the introduction. All in all 75 wonderful photos of royals and houses! And as usual 2 pages with a genealogical outline of the family. Otto von Habsburg died earlier this year, 98 years old, and his obituary The Life of an Uncrowned Emperor is written by Stefan Haderer. Randi Buchwaldt, on the other hand, has contributed with the article Royal Twins, which, as the title suggests, deals with a long list of royal twins throughout the years - from Alexander Helios and Cleopatra Selene, children of Cleopatra VII of Egypt and the Roman triumvir Mark Antony, to the Danish royal twins Vincent and Josephine. Charlotte Zeepvat then continues with the second part of her wonderful article Diddo, Arnold ... and the Urge (Governess Edith Greer, Archduchess Ileana and Archduke Anton of Austria), and the article is close to make claim on the rest of the issue - 23 pages! But as usual we get to read The World Wide Web of Royalty with news of the royal and princely families (page 64) as well as the ads section, which includes information about Diana Mandache's forthcoming publication (30 September 2011), which I also mentioned last time around. The front cover shows the family of Duke Karl Eduard of Saxe-Coburg and Gotha (Karl Eduard, Victoria Adelheid, Caroline Mathilde, Sibylla, Hubertus and Friedrich Josias). 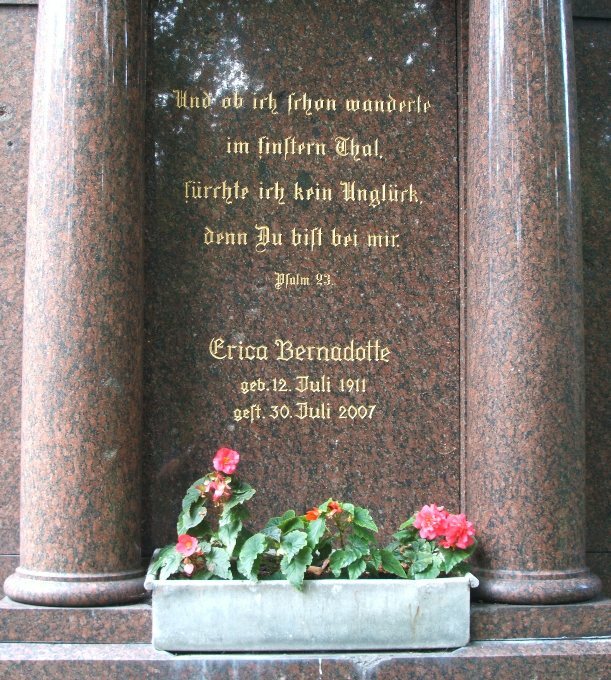 Last resting place of Erica Bernadotte, née Patzek (1911-2007), former wife of Sigvard Bernadotte (born Prince of Sweden). 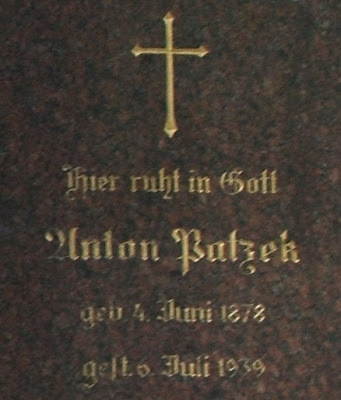 The text above her name was taken from Psalm 23: "Und ob ich schon wanderte im finstern Tal, fürchte ich kein Unglück; denn du bist bei mir." ("Even though I walk through the valley of the shadow of death, I will fear no evil, for you are with me", English standard version). 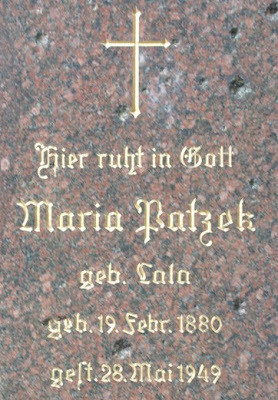 Erica's mother Maria Patzek, née Lala (b. 19 February 1880, d. 28 May 1949). Erica's father Anton Patzek (b. 4 June 1878, d. 6 July 1939). 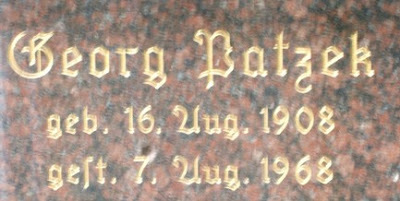 Erica's brother Georg Patzek (b. 16 August 1908, d. 7 August 1968). Just before I left for Berlin for a work trip at the last weekend of August this year, I came to think about Erica Patzek, the first wife of the former Prince Sigvard of Sweden (1907-2002). From Ted Rosvall's "must have" Bernadotte genealogy - Bernadotteättlingar ("The Bernadotte Descendants"), 2010 edition - I had learned that Erica had died in Berlin on 30 July 2007. He didn't know where she was buried, but mentioned in an e-mail that she had lived in Wilmersdorf, Berlin. 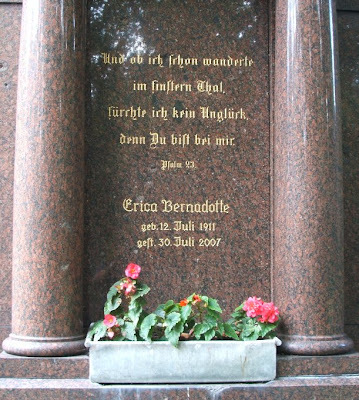 So when I left for Berlin I didn't have much information to go by, other than that Erica most likely was interred somewhere in the current borough of Charlottenburg-Wilmersdorf, but one could of course never know for sure. According to the website of the Senatsverwaltung für Stadtentwicklung (Senate Department for Urban Development) there was no central grave register. 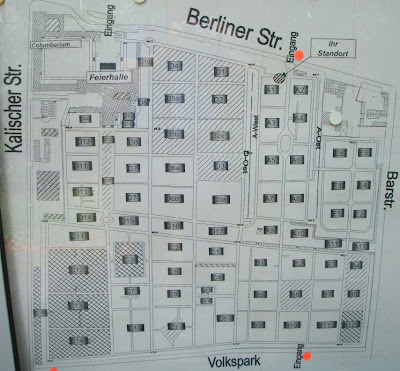 The official website of Berlin could tell that there were 18 cemeteries and crematories in the borough. Now, some of them could because of their nature easily be ignored, but still there were more than a handful of alternatives, and too little time to visit them all. 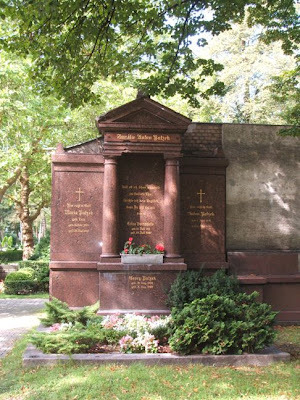 I would most likely have started with checking out the Friedhof Wilmersdorf (Wilmersdorf Cemetery) due to its name and location in Wilmersdorf, but if the cemetery was large "the grave hunting" could turn out to be like looking for the famous needle in a haystack. But I was lucky this time. The city guide the company I work for used for part of the weekend happened to own a copy of Lexicon Berliner Grabstätten by Hans-Jürgen Mende (Haude & Spener, 2005). Erica Bernadotte was of course not included in the book, as she died 2 years after it was published, but there was an entry for her father Anton Patzek, and as Erica never remarried, it was more than likely that she was interred in a grave together with her Patzek family. At least I knew now that Anton Patzek was buried in the section WG1, which was located between the A and D sections. 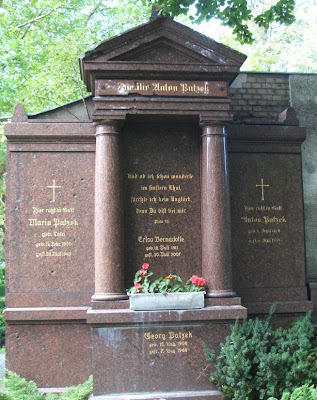 So on the last day of my visit, Sunday 28 August, I took the subway to Blissestrasse (line U7) and walked to the cemetery in Berliner Strasse (81-103). The Patzek monument was located at the wall between the A and D sections (in front of A7, see the map above). If I had not known where the family grave was, I would most likely have started with looking at the larger monuments, but I was still surprised by the size of it. The Patzek family was perhaps even more well-off than I had realized? I will come back with another photo blog article about Wilmersdorf Cemetery, but just want to state the basic facts about Sigvard and Erica: Prince Sigvard of Sweden, Duke of Uppland, was the second son of the then Prince Gustaf Adolf (later King Gustaf VI Adolf) (1882-1950-1973) and his first wife Princess Margaret, née Princess of Great Britain and Ireland (1882-1920). Prince Sigvard married in a civil ceremony at Caxton Hall, Westminster, London 8 March 1934 Erica Patzek*, the only daugher of Anton Patzek and Maria Patzek, née Lala. As Erica according to the Swedish Constitution was a "private man's daughter", i.e. a commoner, Prince Sigvard automatically lost his rights of succession to the Swedish throne. His grandfather, King Gustaf V, also decided that Sigvard, who later developed into a skilled (industrial) designer, was also to be deprived of his titles. After the marriage had taken place, his diplomatic passport was replaced by a "normal blue Swedish passport" with the name Sigvard Bernadotte. Already in 1935 there were rumours that Sigvard and Erica were getting divorced, a rumour that was promptly denied. The couple was, however, divorced in October 1943. Sources: Ted Rosvall. Bernadotteättlingar, Falköping: Rosvall Royal Books, 2010; Aftenposten 9 March 1934 No. 124, p. 6; Aftenposten 4 January 1935 No. 5, p. 4; Sigvard Bernadotte. Erindringer, Copenhagen: Forum, 1975 (Danish edition). *Rosvall:2010 lists her given names as Erika Maria Regina Rosalie, i.e. Erika with a 'k', while the gravestone clearly says Erica with a 'c'. Sigvard Bernadotte af Wisborg's biography also uses the spelling Erica. 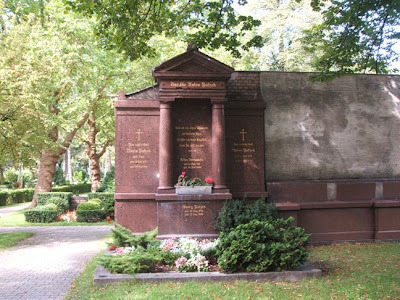 For later articles covering the Wilmersdorf Friedhof, go here (part II) and here (part III). Updated on Tuesday 20 September 2011 at 08.10 (one sentence added in footnote) and 09.00 (typo corrected). Last time updated on Thursday 13 october 2011 at 21.25 (links added). I have earlier commented on the challenges I meet as a blogger when I want to write about and comment on current issues, but just don't have enough time. It is often easier for me to write "timeless" articles, like my many blog articles about cemetery visits, than to write about topics which are "in the news" here and now. Their Royal Highnesses Prince Joachim and Princess Marie are happy to announce the pregnancy of Princess Marie. It is expected that the birth will take place at Rigshospitalet in Copenhagen (Copenhagen University Hospital) at the end of January, 2012. The press release was signed Kurt Bache, Chamberlain, Colonel, Private Secretary. Prince Joachim has from earlier two sons - Prince Nikolai and Prince Felix - from his former marriage to Alexandra Manley, now Countess of Fredensborg, as well as one son - Prince Henrik - with his current wife, Princess Marie, née Cavallier. The future prince or princess will when born enter the line of succession to the Danish throne as no. 10 (see the current line here). Queen Margrethe II and Prince Henrik, the Prince Consort, will by then have 8 grandchildren. The Norwegian Crown Prince couple will have to share their wedding day with the head of the Royal House of Prussia, Prince Georg Friedrich, and his wife Princess Sophie of Isenburg, as their civil wedding took place at Potsdam City Hall on Thursday 25 August 2011 (I wrote about their engagement in January 2011). I was in Potsdam at the same day, having a day off with sightseeing together with a group of "royalty watchers" and bloggers. Funnily enough the bridal couple passed us in their car after the ceremony had taken place, as we were standing at the road between the Sanssouci and Orangery Palaces, but as I was on the wrong side of the car, I didn't get a glimpse of them. The religious wedding was celebrated in Friedenskirche in Potsdam on Saturday 27 August (and that date will surely be more celebrated in the years to come, not the date of the civil ceremony), followed by a reception at Neue Kammern (New Chambers) and a gala dinner at the Orangery Palace in the evening (our group toured this palace on Thursday and witnessed some of the preparations). I have seen different numbers of guests, but apparently 650-700 people attended the church wedding, while around the half were present for the gala dinner. The guests included Prince Hassan Bin Talal and Princess Saravath of Jordan, Princess Sybilla of Luxembourg, Prince Laurent of Belgium, the British Lord and Lady Nicholas Windsor and many members of the former royal, princely or noble families of Germany as well as from other parts of Europe, such as Anhalt, Austria, Baden, Bavaria, Bourbon-Parme, Bourbon-Two Sicilies, Castell-Castell, Castell-Rüdenhausen, Hannover, Hesse, Hohenzollern, Isenburg, Leiningen, Lippe, Oldenburg, Portugal, Prussia, Reuss, Romania, Russia, Saxe-Coburg and Gotha, Schaumburg-Lippe, Solms-Laubach and Württemberg. The newspaper B.Z. am Sonntag produced an ancestry table for Prince Georg Friedrich, besides focusing on politicians and celebrities such as former German football team coach Otto Rehhagel and his wife Beate, Brandenburg Minister-President Matthias and his wife Jeanette Platzeck, the bridal dress designer Wolfgang Joop, the publisher Friede Springer as well as Count Alexander von Kalckreuth and Countess Tamara von Nayhauß(-Cormons) with their children Max and Louis (has she not taken her husband's name and social title?) Berliner Morgenpost brought more photos of royal guests, but also mentioned the singer Max Raabe. Other than the pregnancy, anniversary and wedding mentioned above, I would also to include a future wedding date in my round-up: The wedding of the King of Bhutan, Jigme Khesar Namgyel Wangchuck and Jetsun Pama (see the engagement news here) will take place in Punakha on 13 October 2011. The celebrations wil be held at the Changlingmithang Stadium in the capital Thimphu 2 days later, cf. Kuensel Online 1 September 2011.